ĐÀ NẴNG — President Trần Đại Quang yesterday inspected flood recovery efforts in Đà Nẵng City and visited some of the worst-affected residents. He had high praise for clean-up and post-storm repair work done by authorities of the city that is hosting the ongoing Asia Pacific Economic Co-operation (APEC) 2017 Leaders’ Week. The President noted the APEC 2017 Leaders’ Week was the most important international event of the year for the country in general and Đà Nẵng City in particular. It was an opportunity to boost the image of the country and the city among international visitors, he said. He also lauded the city’s residents for actively coping with the typhoon and taking measures to handle its consequences. At present, the cleaning of streets, urban renovations, replacement and repair of damaged properties had been completed, he was told. Visiting households in Hòa Vang District’s Hòa Khương Commune, the President stressed that the leaders of the Party, the State as well as people throughout the country cared for and shared the difficulties and hardship of people in the central and Tây Nguyên (Central Highlands) regions that were severely hit by the typhoon Damrey. He presented gifts to the residents and asked city authorities to pay close attention to limiting the damage caused and helping victims overcome the disaster’s consequences. City authorities said heavy rains caused by Damrey isolated many areas in Hòa Vang District, flooding 4,500 houses, dozens of hectares of vegetable and aquaculture farms. Total damage in the district was estimated at VNĐ40 billion (US$1.8 million). Alongside helping people clean up their living areas, local authorities should work on hygiene and sanitation to prevent disease outbreaks and help people stabilise their lives, Quang said. 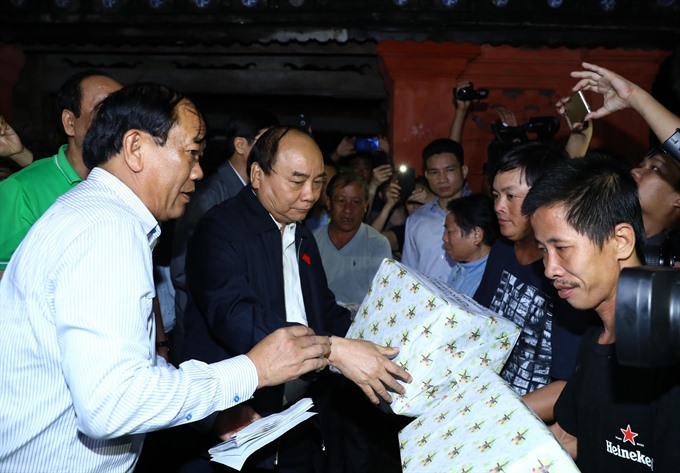 Also yesterday, Prime Minister Nguyễn Xuân Phúc asked authorities in Quảng Nam Province’s Hội An City to take good care of residents and help them overcome soon the consequences of floods caused by Damrey. Visiting Hội An Old Town in bare feet right after activities at the on-going APEC 2017 Leaders’ Week, Phúc noted that the flooding consequences were complicated and urged local authorities to proactively engage in search and rescue operations and pay close attention to ensuring food and daily necessities for affected people. He also asked all forces, including the army, police, youth and local mass organisations, to help residents overcome the damage caused by floods, especially in houses and schools, and soon restore daily life and production. The PM stressed that Hội An, as a key tourist city, needed to be cleaned up soon after waters recede to ensure hygiene and sanitation right, as also provide good services for activities within the framework of the APEC 2017 Leaders’ Week. “This is a key task and it should be done with a spirit of urgency,” Phúc said. The PM also advised Quảng Nam Province’s authorities to exercise caution in planning and acting to address damage caused by the floods in key heritage sites in Hội An. At the same time, preservation work needed to be accelerated to ensure tourism sites return to normal soon, he said. After visiting a number of deeply inundated areas in Hội An City, Phúc presented gifts to several badly affected households. Quảng Nam authorities said Hội An has suffered prolonged and severe flooding over the last three days due to heavy rains, high tides and water discharged from reservoirs on Thu Bồn river’s upstream areas. According Vietnam News Agency correspondent in Moscow, Russian President Vladimir Putin yesterday directed a US$5 million support to Viet Nam for handling Damrey’s consequences. Besides, a II-76 aircraft was asked to be ready to carry relief materials from Russia to Việt Nam. Meanwhile, the Japanese Government, through the Japan International Co-operation Agency, donated 105 water filtering systems to help residents in Thừa Thiên-Huế and Quảng Nam provinces cope with the aftermath of flooding. The filters arrived in Đà Nẵng yesterday afternoon. To support flood victims in the central and Tây Nguyên regions, the Kiên Long Commercial Bank has decided to relax debt repayment due dates and exempt or reduce interest rates for customers badly affected by the floods. As of yesterday, Damrey was reported to have killed 69 people in the central and south-central regions, 20 more than reported on Monday. Most of those killed - 27 - were from Khánh Hòa Province.